It’s been a while but after an eventful April I thought now would be a good time to update you lot on what I’ve been up to. 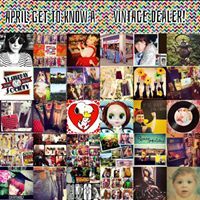 April started with a great concept from a fellow vintage dealer Wish Vintage (@wishvintage) which was using the hashtag #aprilget2knowavintagedealer to share information and find out more about other vintage dealers. 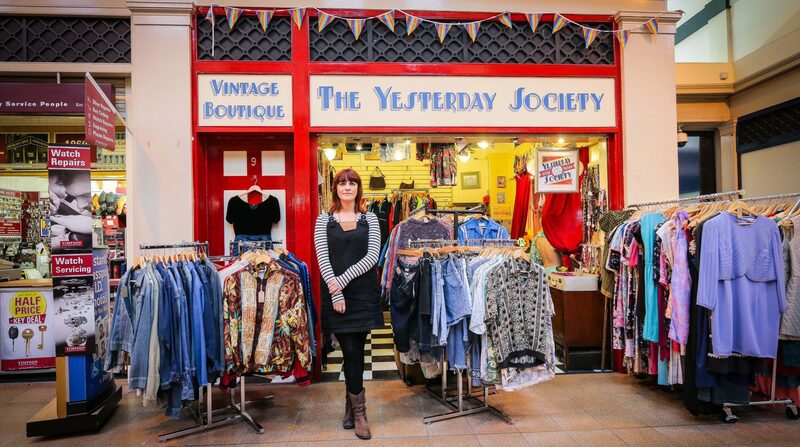 Check it out it’s a great way of finding other vintage dealers. Me and Jay always head off on an adventure at this time of year to celebrate our birthdays which are only one day apart, we also have a book of 1001 places to see before you die which we are working our way through. This year was no different and on Sunday 2nd April we packed our bags and headed off on the open road, here’s what we got up to. After an intense day for Jay working on the van on Saturday by Sunday it was ready to head out on its maiden voyage. Up until around 15:00 on Friday the plan had been to head up to Scotland and visit the Isle of Mull, Skye and surrounding areas. However, Jay received some great advice from a fellow caravaner “to follow the sun” so plans changed and we set off to Wales, on what can only be described as a glorious day. Our first task in Wales was somewhat of a random one, to find and deliver a CD of Jay’s dad and uncles band Segedunum Rust to a distant relative Jay had never met. We eventually found the address but no one was home and couldn’t find a letter box so left them on a doorstep. Only to find out later that they had recently moved to a new house. We found it rather humorous that a random Welshman would return home to find CDs from a Geordie band left with no explanation. That night we drove up to Church Bay in Holyhead to set up camp for the night. We were trying out the Brit Stops book, which details places that allow free stop overs by motorhomes if you put money back into the local economy. That night we stayed in The Church Bay Inn carpark with a magnificent view of the coast. Unfortunately, we had missed food, but popped in for a drink or two. We had of course stocked the van and had a cheese board while watching the sunset. We started Monday off with a trip to Llanfairpwllgwyngyllgogerychwyrndrobwllllantysiliogogogoch which I discovered translates to “St Mary’s Church in the Hollow of the White Hazel near a Rapid Whirlpool and the Church of St. Tysilio near the Red Cave”, being a typical tourist I wanted a picture with the sign. We then drove over the Menai Suspension Bridge (1001) to Caernafon Castle (1001) and spent the morning wandering round the castle and town and trying on pith helmets for size. Next on the list of places to visit was Portmeirion (http://www.portmeirion-village.com/) a place that I could only describe to Jay as a strange looking place where The Prisoner was filmed. Jay hadn’t seen the series and I only had a vague memory of a huge white orb chasing a man in a black turtle neck, but somehow this was enough to warrant a visit. I’m glad we went as I really liked it and my description of a strange place was rather fitting. That night we headed to another Brit Stop and set up camp again with a magnificent view of a lake then headed to the pub for some food. Jay had Lamb (when in Wales and all that) and I had Sea Bass with crab bon bons. Both were delicious and just what we needed after a busy day. My 30th Birthday started early as we had booked on to the 8am Velocity zip wire and Zip World (www.zipworld.co.uk), so before breakfast I was hanging face first over a slate quarry about to do the longest zip line in Europe and fastest in the world! If you’re ok with heights give the video of me doing it. Keeping with the extreme theme we then heading to another zip world site The Caverns an atmospheric underground adventure that has been inaccessible for 200 years, where we climbed and ziplined around a network of underground caves. Birthday dinner was in the form of a cuppa and pug cake given by my mam. As it was my birthday we decided to treat ourselves to a real campsite with showers in the beautiful woodland surrounding Devils Bridge. Needless to say, a few celebratory gin and tonics were needed after such an adrenaline fuelled day. In the local pub we met a couple who we had spotted (due to flowers on their camper) at Portmeirion and were doing a very similar maiden trip for their camper. Jays birthday started with breakfast in bed then a trip to Aberystwyth to visit the National Library of Wales (1001) followed by a visit to the National Botanical Garden of Wales and their butterfly house. It was another glorious day so we enjoyed a stroll around the gardens and impressive greenhouse. On the way to our Brit Stop for the night we stopped off at a local butcher so Jay could have his favourite meal of steak and peppercorn sauce for tea. Again we were met with another peaceful place to stay and a great river view. Thursday saw us visiting Dinefwr to see their herd of historic rare breed Welsh cattle being released from their shelter and seeing the grass for the first time since the winter. Well we have a cow themed van after all and after seeing videos online we were expecting some excitement from the cows. The whole area of Dinefwr was great with a house, castle, bird watching area and deer park all in one. After Dinefwr we headed to The Big Pit (1001) museum of coal mining. It did as it said on the tin and was indeed a big pit but interesting to walk around and hear the similar history to the pits of the North East. The gift shop also allowed us to stock up on welsh cheeses for surprise surprise another cheese board. We started Friday off with a visit to the Caerleon Roman site (1001) after visiting Rome last year and growing up close to the wall, I wasn’t expecting much but have to say it was a pretty impressive amphitheatre. We then attempted a drive to Cardiff Castle (1001) but after a week on country roads in the middle of nowhere the hustle and bustle was a bit too much. So, we changed plans and went to Barry Island (yes of Gavin and Stacey fame) for fish and chips instead. It was everything I expected sun, sand and slot machines. Keeping with the cow theme of the van our Brit Stop that night was Cowpots and the Cowshed. A dairy farm and ice cream producer that had diversified into wood fired pizzas in the old cow shed… ideal. The only thing friendlier that the owner was his welsh collie who wanted to play and chase stones constantly, give me a dog and I’m entertained for hours! That night we tasted the best pizza we had since Rome and were impressed by no less than 6 welsh ciders on the menu. Saturday morning started early with a visit from my new collie friend. We had breakfast (I shared mine with said collie) the headed off to Pentre Ifan Burial Chamber and Blue Stone to see the origins of the Stonehenge stones. We then jumped back in the van and headed to Newport for a dolphin watching trip. It was yet another lush day (I’m not sure how we were so lucky). So, although we only saw some birds and a seal it was a nice trip along the coast in the sunshine. Before heading back to start the trip home we stopped at the Lime Crab for the most amazing fish and chips to fuel up and to catch some last welsh rays. Next PostNext What is vintage?